Photo: from CATS: Show and Pet (1903) by C.A.Housesup5. Courtesy of The Harrison Weir Collection. Midshipmite's singularly notable sibling was his own 'heavenly twin' Romaldkirk Admiral. But there were other siblings from later repeat breedings. From a litter born in March 1898, came the Blue male Romaldkirk Commodore, and Blue female Romaldkirk Flora, both retained by Miss Beal. From a litter born in April 1899 came both Romaldkirk Iris, a Blue female retained by Miss Beal, as well as Crème De La Crème, a valuable Cream male who was sold to Mrs Woodcock, another ardent admirer of Cream Persians. Of Romaldkirk Midshipmite's specific wins, the NCC register confirms the following early wins, which were claimed hand in hand and in opposition to his equally successfully sibling: 2nd Crystal Palace 1897; 1st and Championship Crystal Palace 1898; 2nd Botanic 1898; 1st and Championship Brighton NCC 1899; 2nd Westminster 1899; 1st and Championship, Crystal Palace 18996. 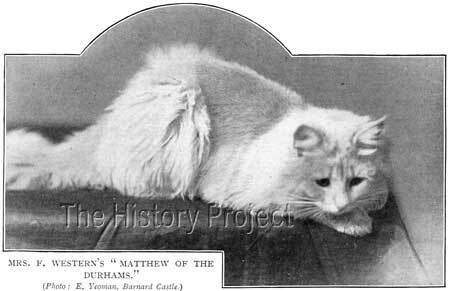 Matthew of the Durhams,Cream Persian male, born August 10th, 1900. Dam: Mrs Hildyard's 'Hazeline of the Durhams'(1899). Of Matthew, Frances Simpson quotes a reporter in 'Our Cats' magazine after the 1901 Botanic Show: "Creams are we prophesy the coming cats. There seems to us, great possibilities in this variety. 'Matthew of the Durhams' is one of the cats we would bring forward in support of this view. 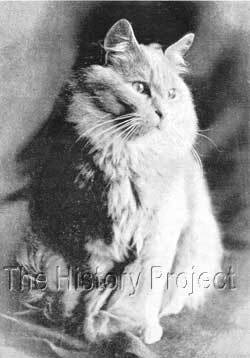 Eminently aristocratic, breathing an air of refinement, this cat might be the petted darling of a princess whose cats are all collected by a connoisseur." 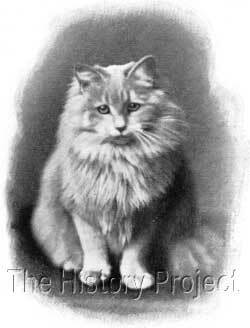 She then confirms that "Mr Western is justly proud of his purchase, for he claimed this fine cat at the Sandy Show, 1901, when he was exhibited by Mrs Darcy Hildyard." Photo: E Yeoman, Barnard Castle. Miriam of the Durhams, Cream Persian Female. Litter sister to 'Matthew of the Durhams'. Of both Miriam and Matthew, their breeder had the following to say: "Hazeline produced five creams, two of which I have kept. 'Matthew' and 'Miriam of the Durhams' both won as kittens at Manchester, and 'Miriam' has since taken first and specials at Barnard Castle, Westminster and Reading. 'Matthew' is growing into a very handsome cat, and I hope to exhibit him at the Botanic…..This I think, distinctly proves that good creams can be got from a pair of the same colour.1"
Crème De La Crème of Wigan, Cream Persian male, born 31st July 1900, was sired by 'Midshipmite' and out of 'Psyche of Wigan' , who is listed as a daughter of Midshipmite's sibling, 'Admiral', making this male, owned by Mrs Woodcock, a direct doubling of the 'Heavenly Twin' combo! Celia of Wigan, Cream Persian female and her sibling Cynthia of Wigan, Cream Persian female, born April 2nd, 1901 both bred by Mrs Hildyard, came from a repeat of the successful breeding which produced 'Matthew' and 'Miriam of the Durhams'. They too became the property of Mrs Woodcock, who was clearly a fan of the Cream Persian and determined to establish a strain which would be dominated by the successful 'Romaldkirk' & 'Hazeline' combination. Evening Primrose, Cream Persian Female, born 13th April, 1901, was yet another cat produced by Mrs Hildyard from repeating the combination of 'Midshipmite' to 'Hazeline' , this time the resulting female being sold to Mrs F. Neate. Primrose of Walton, Cream Persian Female, born 13th August, 1901, was a further repeat breeding of 'Midshipmite' to 'Hazeline', this time, Mrs Hildyard selling to Mrs Gent. Romaldkirk Sambo, Black Persian male, born 25th April, 1898, Owned by Mildred Beal. 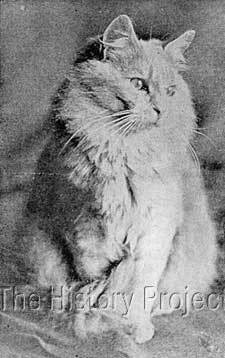 Romaldkirk Sunlocks, Cream Persian Male, born 25th April, 1898. Owned by Mrs Milner. 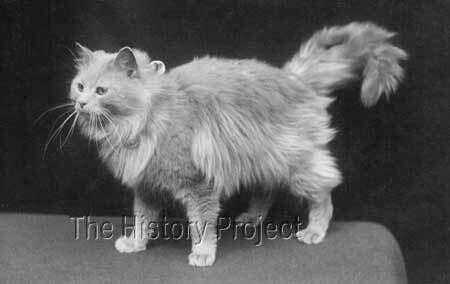 Romaldkrik Pansy, Tortie Persian female, born 27th April, 1899. Owned by Mildred Beal. Mignonette of Romaldkirk, Cream female, born 27th April, 1899. Owned by Winifred Beal. Romaldkirk Canophus, Cream Persian female, born 10th August, 1899. Owned by Winifred Beal. Romaldkirk Cassia, Red Persian female, born 2nd March, 1900. Owned by Mrs W.Edmondson. Romaldkirk Snapdragon, Tortie Persian female, born 2nd March, 1900. Owned by Mildred Beal. Romaldkirk Garnet, Red Persian female, born 1st July 1898, bred out of Mrs Taylor's 'My Fluff' and returned to Miss Winifred Beal for breeding. 'Garnet' was subsequently bred back to her sire's brother 'Admiral' to produce a Cream Persian female, 'Romaldkirk Flirt', born in April 1900. 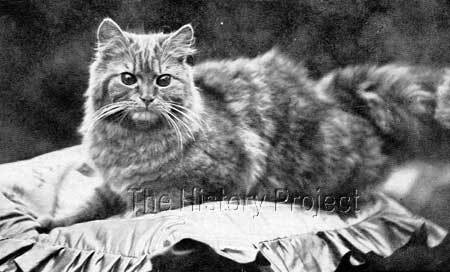 Tomboy, Blue Persian male, born July 1898, bred by Mrs Collier, out of 'Daisy', and subsequently sold to Miss L.Saward. Brough Dolly, Cream Persian Female, born 15th April, 1899, also bred by Mrs Collier, out of 'Mimosa' and retained by her for breeding. 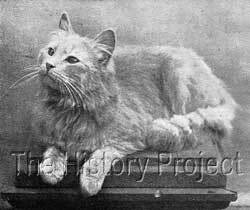 Orange Girl, Red Persian female, born 12th May, 1901, bred by Mrs Singleton, sired by 'Midshipmite' and out of 'Monstrosity'. Of note, is that a good number of the progeny of both Midshipmite and his brother 'Admiral' expressed significantly deep and sound eye colour. 'Orange Girl's' depth of eye colour can be seen in the photo immediately below, and 'Daphne' the daughter of 'Admiral' is notated in the register as having 'brown' eyes. Both of these photos of 'Midshipmite' were clearly taken at the same time or are from the same source, with surprisingly different results due to the reproductive processes used. The first is from a 1908 publication, Captain Kidd and Sinbad The Sailor, by C. S Senour3, while the second is from a 1903 publication, Cats: Show and Pet by C.A.House5. 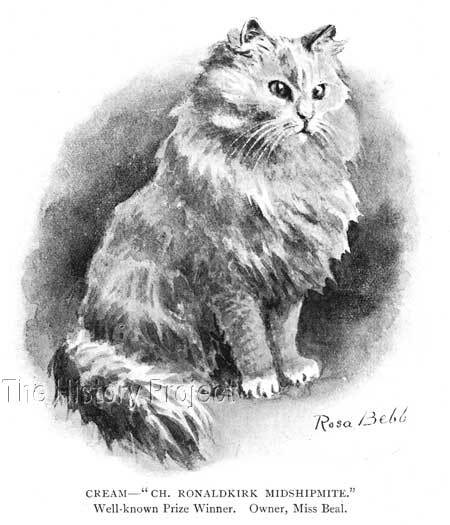 Clearly this illustration, by Rosa Bebb, which was included in Charles H Lane's book Rabbits, Cats & Cavies(1903) was also based upon the above photograph of 'Midshipmite', but in the absence of photographs, such illustrations are a critical and valuable insight into how these cats were perceived by their admirers.